Home » Food and Nutrition » What Are Zinc Deficiency Symptoms? Many people are likely unaware of the various zinc deficiency symptoms. According to the World Health Organization, zinc deficiency is a problem for 31% of the global population, and in the U.S. about 12% of the population is likely at risk. Up to 40% of the elderly are thought to be deficient in zinc as well. Manufacture hydrochloric acid in the stomach for digestion. 1. Major visual signs: There are certain zinc deficiency signs that stand out. For example, you may notice white spots on the nails, or your nails may take a long time to grow. The person may also notice a loss of taste or smell, or a thick white coating on the tongue. Other visual signs and symptoms of zinc deficiency include dandruff, hangnails, inflammation of the nail cuticles, and a loss of appetite. 2. Acne or skin rashes: Some people with zinc deficiency also experience acne and skin rashes. Zinc is responsible for the formation and maintenance of oil glands, which can help decrease acne breakouts. That said, other zinc-deficient issues such as allergies and leaky gut syndrome can also lead to various skin problems. 3. Poor brain function: Studies have found that a zinc deficiency changes brain function. Low levels of zinc are associated with neuropsychological disorders in children, and these can continue into adulthood. A study published in the American Journal of Clinical Nutrition in 1998 found that zinc supplements can improve a person’s attention span. 4. Thinning hair or hair loss: Sometimes, a zinc deficiency causes hair to fall out. Common causes of hair loss include hypothyroidism, adrenal fatigue, heavy metal toxicity, autoimmune disorders, parasites, malabsorption, stress, and nutritional deficiencies. It’s thought that hair loss due to hypothyroidism will not improve unless a zinc supplement is taken along with the thyroid drugs. 5. Food and environmental allergies: Environmental and food allergies can also arise from a zinc deficiency. Zinc is key in how histamine is stored in the body, and being deficient in zinc will result in more histamine being released into the surrounding tissue fluids. In turn, this means that a high histamine level in the body will lead to allergy symptoms such as hives or a running nose, and reacting to certain foods. Also note that chronic stress will lead to zinc deficiency and contribute to high histamine levels. 6. Poor digestion: Leaky gut syndrome is another name for increased intestinal permeability. It can lead to several digestive and immune system–related conditions, including allergies, skin disorders, autoimmune problems, and nutrient and malabsorption problems, including zinc deficiency. A study published in the journal Inflammatory Bowel Diseases in 2001 found that zinc supplementation can resolve intestinal permeability in Crohn’s disease patients. 7. A weakened immune system: Zinc is an important nutrient for cell growth. It’s also needed to help kill harmful bacteria, viruses, and cancer cells. 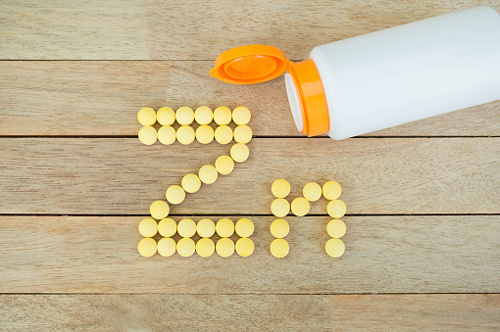 Zinc deficiency can decrease or weaken antibodies in the immune system, which means that deficiency in zinc may be responsible if you frequently get colds or the flu. 8. Diarrhea: Likely due to a poor immune system, diarrhea can be a major sign of a zinc deficiency. You will also likely have longer and more frequent bowel movements. There are particular signs and symptoms of zinc deficiency that may indicate a more serious condition. Some of these symptoms include recurring infections, extreme or unusual weight loss, and developmental delays in children. When these symptoms occur, it’s important that you contact your doctor immediately. Other health conditions are linked with zinc deficiency and zinc absorption issues, including diabetes, rheumatoid arthritis, hemodialysis, HIV/AIDS, sickle-cell anemia, chronic kidney disease, inflammatory bowel diseases such as ulcerative colitis and Crohn’s disease, and nutrient absorption syndromes such as short bowel syndrome and celiac disease. Alcoholics and those with alcoholic liver disease can also have poor zinc absorption. Patients taking diuretics and those with stressful conditions such as burns, sepsis, or a head injury, may also have a zinc deficiency. What is the Best Zinc Dosage? According to the National Institutes of Health, males aged 14 and older need 11 milligrams of zinc per day, while females aged 14 to 18 need nine milligrams; females 19 and older require eight milligrams. Also, children aged nine to 13 need eight milligrams of zinc. Strict vegetarians are also thought to require as much as 50% more zinc since the high phytic acid levels in grain- and legume-based foods will reduce zinc absorption. It’s also very important that pregnant women increase their zinc intake because the mineral is required for the development of the fetus. Twelve milligrams is necessary for pregnant females 18 and younger; 11 milligrams if they’re 19 and older. Lactating females under 18 need 13 milligrams, while those 19 and older need 12. Newborns require two milligrams of zinc up to six months of age; three milligrams are needed until they reach three years old, and five milligrams are needed for those four to eight years old. Zinc supplementation is best when taken with a protein meal; otherwise, it may cause nausea. Zinc can be found in high-potency multivitamins and mineral supplements, and in an antioxidant combination called “ACES plus zinc,” which also contains vitamins A, C, and E, and selenium. There are also plenty of foods that are goods sources of zinc. Zinc is absorbed better from animal foods such grass-fed beef, lamb chops, egg yolks, herring, calf’s liver, venison, and shrimp. Oysters are by far the best source—they contain 10 times the amount of zinc than any other food. Other good zinc sources include mushrooms, summer squash, spinach, asparagus, chard, collard greens, green peas, pumpkin seeds, mustard seeds, broccoli, soybeans, ginger, black pepper, and chili powder. Lastly, note that zinc is depleted by cooking foods in water. Mateljan, G., The World’s Healthiest Foods: Essential Guide for the healthiest way of eating (Seattle: George Mateljan Foundation, 2007), 802–803. Sturniolo, G.C., et al., “Zinc supplementation tightens ‘leaky gut’ in Crohn’s disease,” Inflammatory Bowel Diseases, 2001; http://journals.lww.com/ibdjournal/Abstract/2001/05000/Zinc_Supplementation_Tightens__Leaky_Gut__in.3.aspx. Sandstead, H.H., et al, “Effects of repletion with zinc and other micronutrients on neuropsychologic performance and growth of Chinese children,” American Journal of Clinical Nutrition, 1998; http://ajcn.nutrition.org/content/68/2/470S.abstract?sid=1a363375-ae59-4119-b32d-a85c651862fd. “Zinc,” Linus Pauling Institute website; http://lpi.oregonstate.edu/mic/minerals/zinc, last accessed March 28, 2016. Johnson, L.E., “Zinc,” Merck Manual Professional Version website; http://www.merckmanuals.com/professional/nutritional-disorders/mineral-deficiency-and-toxicity/zinc, last updated March 2015. “Zinc,” National Institutes of Health web site; https://ods.od.nih.gov/factsheets/Zinc-HealthProfessional/, last accessed March 28, 2016.